Mount Bromo Ijen Crater Tour 3 Days 2 Nights. Travel to East Java Indonesia explore the best volcanoes of Mount Bromo and Ijen Crater Lake. Our company offers to those of you who will come to Indonesia, especially visiting Mount Bromo and Ijen Crater. Mount bromo ijen tour package that we offer are very flexible, you can manage your own time and anytime because what we provide is a private tour program to Mount Bromo Ijen Crater Tour 3 Days. Only to share tourist information to Bromo Ijen Tour From Surabaya. You will never regret it when you visit it even though this trip feels tiring for most people because it is too far a journey taken. From surabaya to mount bromo for about 3,5 hours drive, 5 hours trip from mount bromo to Ijen crater and 7 hours drive from ijen to surabaya. This is a 3 day tour, 2 nights from Surabaya to Bromo and Ijen Crater Blue Fire and ends at the Surabaya City Center or Ketapang Harbor to Bali. You can start the journey directly from the Surabaya airport or station or hotel upon arrival in East Java and it’s standard travel offered by most travel companies. to Mount Bromo and ijen Crater Tour From Surabaya and Return Surabaya again or finish tour at Ferry To Bali. On trip to Surabaya Mount Bromo Ijen Crater Bali Tour 3D2N, it is expected that in prime body condition because this tour is quite tiring because every tour to Bromo and Ijen is required to get up early in the morning and sometimes fall asleep in the car, it is common. If you come to Java and are going to Bali, take a Mt. 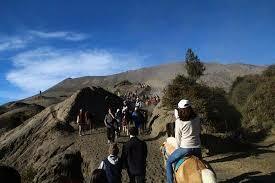 Bromo Ijen Crater Tour drop off Ferry Port or Bali. This is what many foreign tourists do before continuing their tour on the island of Bali rather than having to return to Surabaya or Malang Airport with an 7-8 hour drive. Pick up participants at agreed locations, mostly from the train station in Surabaya if they have just finished their tour in Yogyakarta or from the Surabaya international airport if they come directly from your country. A jeep that came to pick up around 3:30 a.m. and the driver took us to Puncak Penanjakan to catch a sunrise overlooking Mount Bromo. Finish bromo sunrise tour then take a jeep to Mount Bromo (parking area) to continue climbing / walking to Bromo crater. The hiking trip takes less than 45 minutes and there are locals who provide ponies for people who are lazy to walk or just want photos. After the trip to Bromo, return to the hotel and continue with a 6 hour drive to reach Ijen. Check in hotel ijen and take a break. Climbing to Mount Ijen is more manageable compared to other mountain climbing, be prepared to climb the slopes of Mount Ijen starting at 1am to chase the Ijen crater blue fire and highly recommend for anyone to rent gas masks because sulfur smoke can be very dangerous in some parts of the climb. Next after the blue fire ijen tour, the guide took us to another place to see the sunrise. Then taken to see Lake Ijen which is green from the chemical reaction of sulfur. Your name, your e-mail, phone (whatsapp), number of participants, date of tour, details of arrival and departure. Before you choose Mount Bromo Ijen Crater Tour package 3 days, You must take the flight or train ticket arrival at Surabaya in the morning or day time and on day 3 take at evening around 19.00 – 21.00 p.m. Or other options if the end of the trip back to Surabaya can take the flight / train ticket arrived in the morning and the 3rd day take flight or trains ticket at least 15:00 p.m. With the tour schedule Surabaya to Ijen on the first day then to Bromo and finished in Surabaya. Hope You prepare mountain clothes (Jacket, Gloves, Hat, Trekking Shoes, Trekking Pole) because the temperature on both these volcano peaks around 05 – 15 degree centigrade.